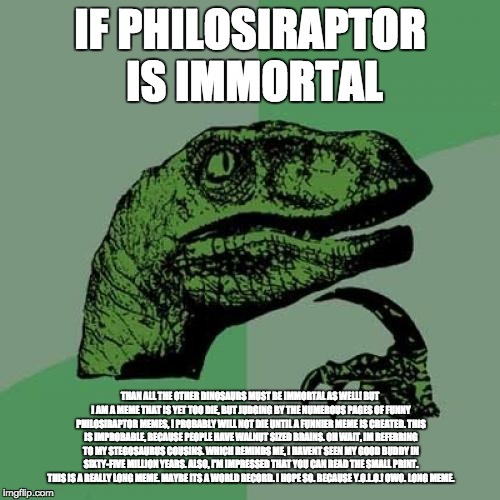 IF PHILOSIRAPTOR IS IMMORTAL; THAN ALL THE OTHER DINOSAURS MUST BE IMMORTAL AS WELL! BUT I AM A MEME THAT IS YET TOO DIE, BUT JUDGING BY THE NUMEROUS PAGES OF FUNNY PHILOSIRAPTOR MEMES, I PROBABLY WILL NOT DIE UNTIL A FUNNIER MEME IS CREATED. THIS IS IMPROBABLE, BECAUSE PEOPLE HAVE WALNUT SIZED BRAINS. 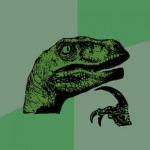 OH WAIT, IM REFERRING TO MY STEGOSAURUS COUSINS. WHICH REMINDS ME, I HAVENT SEEN MY GOOD BUDDY IN SIXTY-FIVE MILLION YEARS. ALSO, I'M IMPRESSED THAT YOU CAN READ THE SMALL PRINT. THIS IS A REALLY LONG MEME. MAYBE ITS A WORLD RECORD. I HOPE SO. BECAUSE Y.O.L.O.! OWO. LONG MEME.